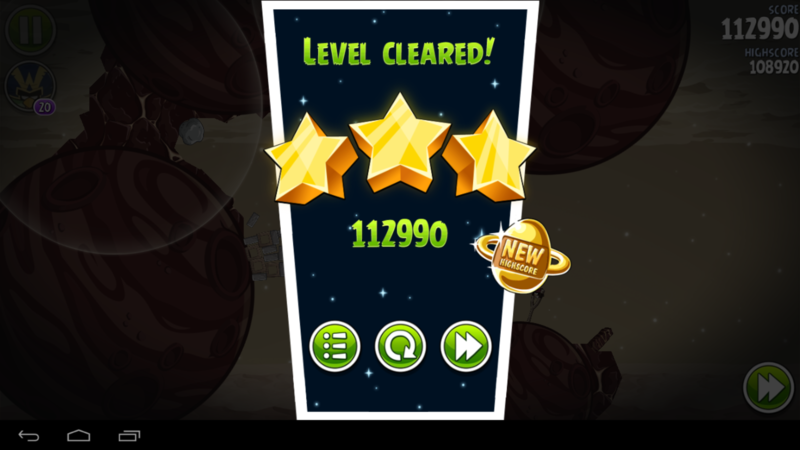 Here is our strategy for Angry Birds Space Red Planet Mirror Level M5-9. This level is unlocked by obtaining 3 stars on Red Planet Level 5-9. The strategy shown yields a score of 108,580. @admins 99060 is 3 star. @hoy49 is 99k an estimate or the real deal? If it’s an estimate ‘all’ we need is to find out what 98k is right? I had two 99k scores and both were 3 star. I could not get a 98k. I would not confirm the 3 star score until we had a 98k. Thank you @mvnla2 @hoy49 and @sparty83 for that teamwork! Another one we can cross of the estimate list! 110k with the video method. Same shots as walkthrough. I tried @comex666’s method of hitting the triangle, but I couldn’t get it to work on my iPad. I’ll keep trying. Plenty more points were left for the taking. However, for now, I’m happy with my current result of 111,520. Thank you @comex666! Congrats on your high score and puppy too. Well done!